Now that's how you do a season finale! Unlike last year's ender, which left us hanging for 10 months, Vikings Season 2 Episode 10 gave us some actual closure. Of course, we're well aware that Vikings has been renewed for Season 3, but this week brought an end to Ragnar's chapter as Earl. It's good to be the King. Floki inquired about that proposition Horik mentioned last week. He later taunts Athelstan telling him no one wants the "priest" there. Now that we know it was all an act, is there any truth to Floki's mistrust of Athelstan? He later visits Rollo and stuffs some magic mushrooms in his mouth. Floki is definitely an odd bird. The cruelest thing he did (well aside from betraying old King Horik) was scare Ubbe with that creepy story when he asked the boy to take some more mushrooms to Torstein. Tell me you didn't hate Floki when it appeared Torstein died in the next scene? What about Rollo I thought? He took the same damn mushrooms. Horik, now convinced he can trust Floki tells him the plan is to kill them all. Wipe Ragnar's family from the face of the Earth. He tasked Floki with killing Bjorn. Though it seemed Floki had joined the dark side, part of me couldn't believe he'd kill Bjorn. I was so disappointed in Floki at this point. Next Horik attempts to get Siggy to do his dirty work for him as well. Kill Ragnar's young sons he tells her. Did anyone else wonder if she had not chosen a side until this conversation? Ragnar had spared her life, as well as her daughter's when he became Earl. Didn't she owe him some loyalty? What was up with Porunn anyway? Was she just playing hard to get and did she really think Bjorn would fight her? Ok so she was demanding respect, but until his quick comment about having any woman he wanted, he hadn't disrespected her or did I miss something? The fighting leads to kissing and soon they're getting naked out in the fields, with a sneaky Floki watching. 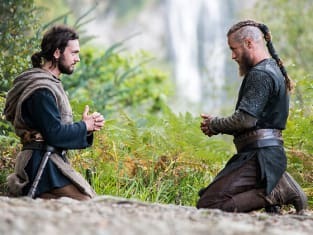 Horik shows his son the sword of the King. He tells the boy they must overcome the magic of Ragnar Lothbrok and kill his entire family. While Horik's attack begins, Ragnar and Athelstan share a peaceful moment. What a unique friendship these two characters share. Ships loaded with warriors dock in Kattegut, Horik's wife puts on her armor and the sneaky King marches toward the great hall in search of Ragnar. Aslaug stares out thoughtfully as Siggy runs for cover with the Lothbrok boys. She didn't need a vision to know how all this would end. Lagertha and Horik's wife battle it out and it didn't surprise me that Lagertha won. What did shock me a bit was Lagertha turning toward Horik's young children. Sure, as Horik explained earlier, if any family were left alive they would one day return to seek vengeance. I'm just glad Ragnar had made arrangements of his own and that blood was not on Lagertha's hands. Floki comes to Bjorn's aid and when he tells him he's been looking after him as he promised his father, everything finally fell into place. I admit, when Horik entered the great hall I expected Ragner not Torstein to greet him. However, it was so much better realizing that Torstein was alive. I was wondering how Floki would explain that death. It was now clear the mushrooms were harmless and Rollo was safe as well. Floki played Horik well. Floki: No King Horik, I only betrayed you. I was always true to the Gods and Ragnar. Permalink: I was always true to the Gods and Ragnar. When Horik realizes he's lost and begs for the life of his son, I thought there's no way Ragnar is going to let this kid live. He'll be fueled with rage and vengeance until he settles the score for the death of his entire family. I didn't see Horik's son die though, will we find out more next season? Horik had to go, I've been saying this for a while now in my reviews but watching Lagertha, Bjorn and Torstein take a stab at him was brutal. Floki didn't take his turn, he had done his fair share either way. I've got to say I'm happy this was Ragnar and Floki's plan from the start. We can like the trickster again. What really shocked me was Siggy walking up to Ragnar and handing him the blade Horik gave her to kill Ragnar's sons with. Apparently, she was grateful to Ragnar for sparing her life. Besides, she seems to have formed a strong bond not only with Lagertha but Aslaug as well. When everyone slowly cleared the room, you knew something serious was coming. Ragnar doesn't just stab Horik, he goes full out berserker on him. That was something else wasn't it? Bjorn arrives to find all of Horik's family slaughtered. I'm assuming the girls he allowed to leave were their slaves right? It was a necessary but vicious sight to behold. Thank the Gods Floki was on Ragnar's side from the start. This prepared them for Horik's betrayal and they one-upped him. I had a feeling King Horik would meet his end in the finale, especially since Donal Logue is starring in FOX's Gotham in the fall. I want to thank everyone that has taken the time to comment here at TV Fanatic and for all your kind words. This might be my last review of the season, but at least we've got next year to look forward to right? Hope to see you guys over at Twitter. 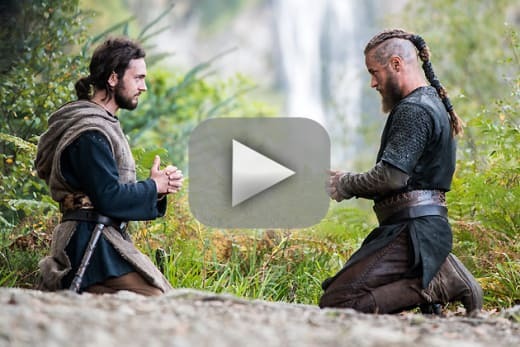 Have a wonderful summer and remember you can watch Vikings online right here at TV Fanatic! What did you think of Vikings Season 2?